The Old School was founded as a National School in 1849. 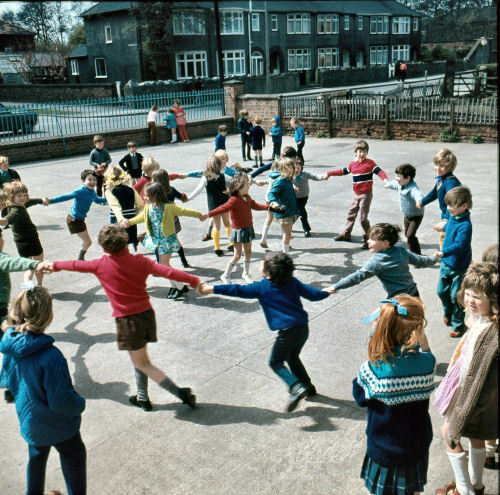 This was a time when there was a great deal of new school building all around the country, both Sunday and Day Schools. Ten years later, in 1859, the land of the present site was donated by the Harrison-Broadley family for a new school, and this is the building we have today. To all outward appearances, it is largely unchanged, except perhaps for the flagpole and a grassed-over playground. 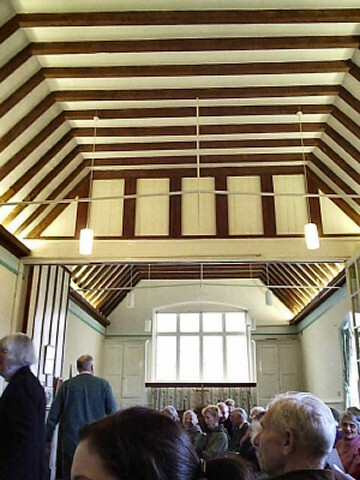 A really observant visitor would notice that the two wings were later joined together when the recess was filled in by an new classroom, and this is now our tearoom. .
Now the St James' Church of England School, it thrived during the rest of Queen Victoria's reign and into the 20th century. The first days of the Great War saw a battalion of soldiers come to the village for billeting before being sent to France. Many were billeted inside the school, and we believe it may also have been used for a short time as the battalion HQ of a huge tented encampment in the grounds to the rear and right down the gentle grassy slope onto the lower ground. Our undertanding is that it was one of the two service battalions of the East Yorkshire Regiment who came here first, around a thousand men in all. The late twenties saw the school pass from county council control to Hull City Council when the city's boundaries were extended to take in the whole of Sutton parish. Similarly, during the first days of the Second World War, the military were here again for quite a few weeks until other more permanent arrangements could be made. We believe many hundreds of soldiers passed through these gates at various times during both wars, and in 2014, we placed a memorial stone inside the school to those that never returned, as well as those who also served. The school continued with the building owned by the church, but with the educational apects under local education committee control. The authority maintained the building and grounds, employed the teachers, and provided all necessary equipment, as it did for state-owned schools. The arrangement continued until it was deemed that the building was too small for modern requirements. 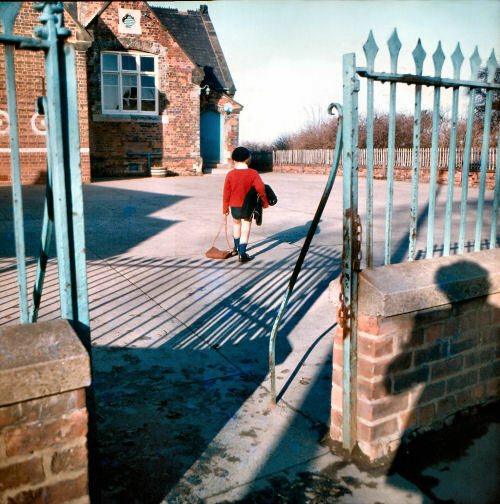 The school leaving age increased after the war, but Sutton was still an 'all-age' school, for children from infants at five years old, to school-leaving age at fifteen years. As such, it had long been overdue for replacement, even from the 1940s, but it was not until a replacement St James' School was built, in the mid-1970s on the nearby Bransholme estate, that, in 1977, this Sutton village school finally closed to pupils. As the building itself was now deemed to be surplus to requirements, there had been a plan to demolish the old school and clear the site, initially to make a car park. This was prevented on the very day demolition was due to commence by the quick thinking and determined action of the wife of the rector of St James' at the time. Both the Reverand Terry Doherty and his wife Deanna, also an ordained priest, between them saved the day, and for a time, the old village school was used as a temporary store. 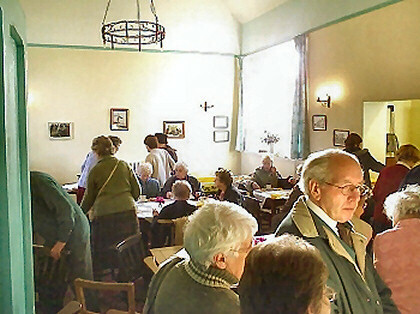 In the late 1990s, it was decided that the old building could once again be put to some educational use, as a church education centre, and so the old school was saved yet again. No one can seem to put their finger on an exact date for this, but it was around 1998 that the current museum really came into being. Former teacher, Merrill Rhodes, whose own children had attended this school but who herself had worked at other Hull schools, was employed by the church as a school liaison officer, working with more than two dozen local schools in the Hull local authority area. Merrill began to collect records and artefacts, at first those specifically connected with the school. Hence we have copies of the old school registers dating back to 1876, and the wonderfully rare 'school log', filled in every day by the head teacher of the time. One thing that did become abundantly clear as time went on, both from this increasing collection of school photos and the spoken memories of former pupils, was that this was very much a 'happy school'. The fun and laughter that existed alongside the learning is palpable, and a sense of that era exists still when the place is full of visitors enjoying our history. If one word captures the esence of most photos, it's 'joy', a word not often bandied about today. We try to bring a sense of that joy back. As is the way with these things, word spread and donations of more general artefacts connected with the village also began to come in, documenting in the main the domestic side of village life. Kitchen and cooking equipment, sewing and dressmaking items from thimbles to full sewing machines - all were quickly joined by garments of past decades, and then by a much wider cross-section of items that could more widely be deemed as 'local social history.' Along with donations of medals from the families of former Sutton servicemen and general memorabilia of both world wars, the collection of artefacts that our great-grandparents would have recognised very rapidly increased. It all came together in a very short space of time, two or three years or so. By the turn of the century, when Merrill published her Millenial book outlining the history of Sutton, Bransholme and Wawne, the collections of photos, documents on the big houses, noted local families and businesses, was pretty much as it appears today. The collection as a whole really was Merrill's inspiration, and it was around that time it was decided to make one room of the old school into a permanent exhibition, for though termed as such at that time, it was never conceived that it could ever become a museum in the usually accepted sense of the term. But in the fullness of time, and no one can quite put their finger on when, it did become what is in effect a Folk Museum in its own right - though it still retains its original concept of somewhere to come to research your local family history, or any local history for that matter. A committee was formed, headed by Merrill and her husband Peter, and what we see today slowly started to take shape. The building was redecorated by willing volunteers, retaining as many of the existing school features as possible. The Dohertys, original saviours of the building and now almost on the point of retiring from clergical duties, were still heavily involved in helping Merrill and Peter's fledgling committee, themselves contributed an enormous amount of their own funds to help the whole project along. The original school clock, for a long time hanging dormant on the wall, was restored to working order and once again marked the hours of the day. 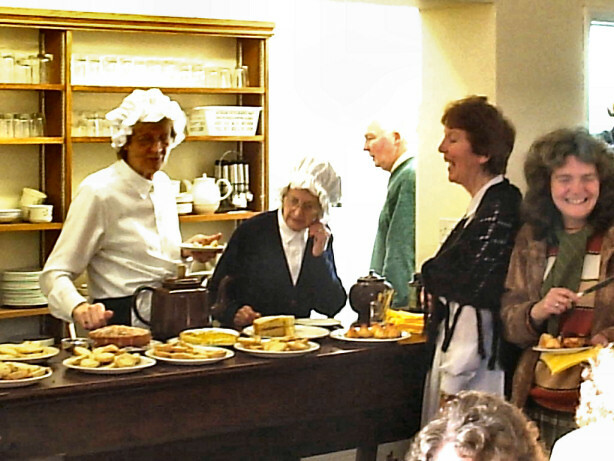 One room was converted to what is now our tearoom, though it also doubles up as a workroom and exhibition space, and a fully fitted kitchen added next door with a serving counter between. School parties from all our local schools, but particularly the new St James' School, now just a few minutes short walk away, were invited to visit, and over the following years, such school visits have become increasingly regular and very welcome event of the building's annual life, several such visits per year in fact. Indeed, our schools have helped enormously with fund-raising to help the museum thrive and continue to run from month to month. Given that it on record that it was such a happy school, it is more than satisfying, indeed heartwarming, on these school visits to hear the very rafters ringing again with the chatter and laughter of young children, and singing, as it did in years before. The new St James' School, now an acadamy, give us a small but very accomplished carol concert every Christmas, just before breaking for the holiday. The link between the new school, the church and this Old School, is still extremely strong and enduring. Of course, Sutton is not a village in isolation. Its history is very closely bound up with the nearby village of 'Waghen', here using its ancient spelling, and much more so than many other such neighbouring villages. Few may know that in the Middle Ages, Waghen and its church was the senior village of the two, and was far more important in 1300 than Sutton. Merrill collected information on all the local farming families of old, many of which had intermarried with other farm families in the wider area, and in many respects, the records collected and research undertaken showed that this new 'heritage centre' owed much to a far wider historic area. We believe many links between families go back much further than most folks realise today. To well before current written records show. Most families are indeed fortunate to find documentary evidence, birth or baptism records, to much before the 1700s, but such links were surely already there way back to even before Tudor times, and indeed the Middle Ages. Hence the history of Stoneferry and Wawne is so closely intertwined with that of Sutton that it would be reflected in the fullness of time in the choice of the full name of the museum. Few people realise that until about the 1880s, when the 'new' parish church of St Mark's was opened, the original Sutton St James' parish extended along the river so far south it went as far as Witham, along that road's north side, thence north back up Dansom Lane. It was a huge parish, with Sutton itself at the far northern end. That explains why the 1881 census has so many births recorded as in Sutton parish, but were actually born in Stoneferry and the area around St Mark's, formerly known as 'The Groves'. From about 1999, the "Sutton Exhibition & Resources Centre" as it was known, has opened every Friday for four hours across lunchtime, 10.00am till 2.00pm, and very successful it has been too. As word spread, visitors came from far and wide, firstly perhaps to view the school of their ancestors, then to view the regular exhibitions. Some came in, or dropped by, because they saw the notice on the gate, offering a welcome cuppa, a biscuit and a chat about the old days. Some of the volunteers started to do basic family history research, and collections of census CDs and other family history records were acquired to use alongside the school registers. Indeed, a good number of our growing collection of photos of both villages came about from chance cups of tea, the word getting about that we were trying to conserve a little of Sutton and Wawne's disappearing history. So much so that in photos alone, we now have some thirty albums all archived and indexed by Merrill for visitors to browse through on Fridays. Our collection of maps has to be seen to be believed, once again, largely Merrill & Peter's work. The popularity of family history programmes on TV certainly helped to foster this growing hobby and also help to secure the immediate future of the building. 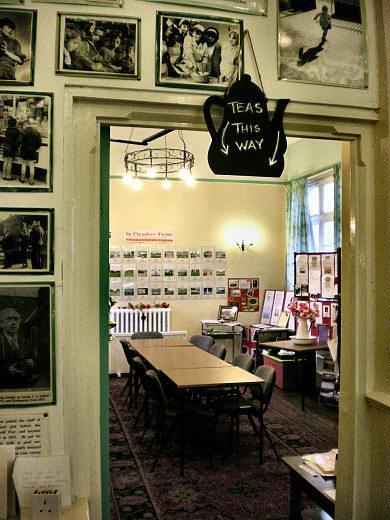 For the first 15 or so years, the major financial support of the Old School for heating and lighting has been the Ann Watson Trust, a local financial body almost 300 years old that makes grants according to the bequests of Ann Watson's will. One of the criteria was support for educational establishments just such as The Old School and its work with today's generation of children. 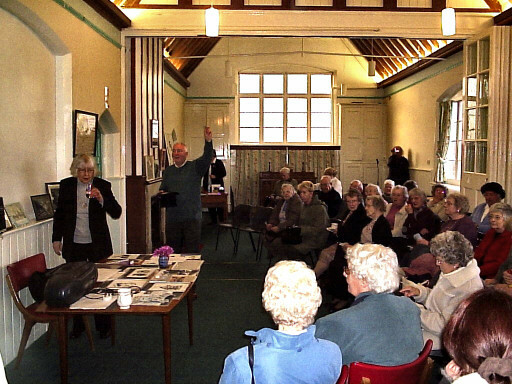 The Old School went 'live' with its own website in 2000, following the first pages that documented the village's war dead. Researching wider history, where all three types of history - military, family and social history - now combine and are researched in equal proportions by volunteers every week for our constant stream of visitors and enquirers, some of whom come a very long way indeed. The Old School was able to celebrate its 150th Anniversary in 2009, with a huge school re-union and what effectively became a big party. There was even a cake. By this time, we were proud to be able to say that we were now the oldest former council school in Hull that is still used for an educational purpose. 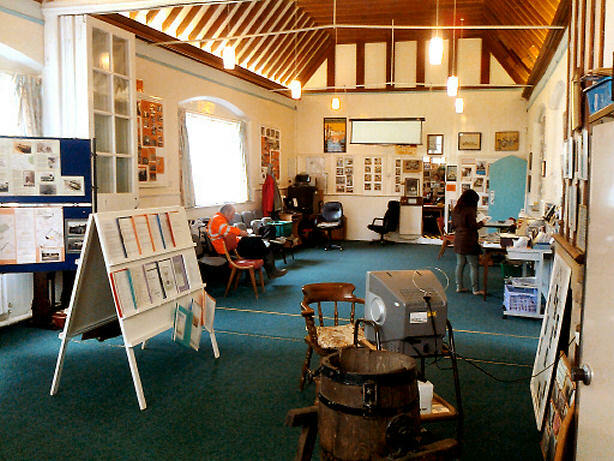 The "Friends of The Sutton & Wawne Museum" was formed in 2013 following what was seen as the potentially disastrous condemnation of the ancient boiler and heating system. The Old School needed to replace the heating system, and fast, before any major part failed. 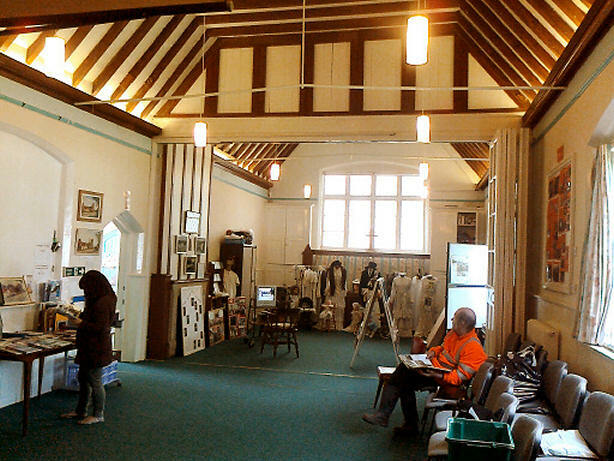 Had the old boiler given up the ghost that following winter, with no heating, the building would have had to close, not just as a museum and exhibition space, but also to the several other users that hire the school hall on a weekly basis. The building, and collections within, were in grave danger. The fact that we were able to stay open played no small part in raising the funds required; it was a close-run thing. So "Friends" was formed, and donations rapidly came in from many individual sources, as well as a couple of major grants. Support via local ward councillors enabled the city council to give us not only a financial boost towards the new heating, but also the recognition that comes with a visit by the Lord Mayor, Councillor Mary Glew, in January of 2015. The decision was made to fully convert to electrical heating via time-clock controlled oil-filled radiators of a German design. Along with all the donations, many raffles, sales and proceeds from exhibition events and Heritage Days all swelled the coffers required to save the day, and the new system was installed and working by the winter of the following year, 2014. We are about to embark on a new era in our museum. From 2016, we have to be totally self-funding for all our maintenance costs and lighting and heating bills. We have a good deal of work ahead in order to secure what the Doherty's saved, and Merrill and Peter subsequently built upon, and to ensure the Old School survives into future decades to tell the story of a way of life fast fading from memory. And it is not just memories that are fading away. Some of our earliest and staunchest volunteers are sadly no longer with us, and we desperately need more volunteers to take us into the future. So although we are still proud to embrace the fact that we are a 'Free Museum', we also welcome donations and support from wherever we can find it to further our endeavour. We hope, as a family history research centre, we give value for money when visitors make donations to enable us to carry on printing photo copies for them from our huge collections of photos of their ancestors and relatives, as well as village scenes. And of course, we welcome visitors just to look, and hopefully remember, how things used to be in village schools and village life such as ours up and down the land. Over and above all that, we also hope we inspire today's young people in fostering a strong sense of our history and how that is inevitably connected to their own family history as they discover it. All eras of history are rich and in Britain we are particularly rich. 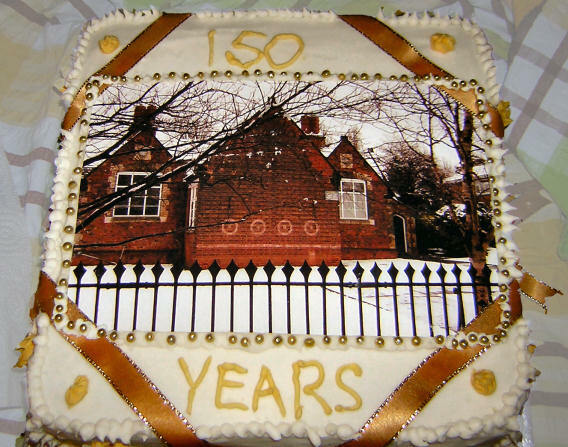 We hope that The Old School, and the Sutton & Wawne Museum within it, with all that we do, enhances our local richness. We are proud to term ourselves a 'Folk Museum', and just as proud of the fact that it is the folk of Sutton & Wawne whose story we tell, both those folk of yesteryear as well as of today.